It all started with one universally flattering trouser. Dress pants, also known as trousers, are great for the office. High waisted wide leg pants like palazzo pants and culottes are a breezy warm weather option. 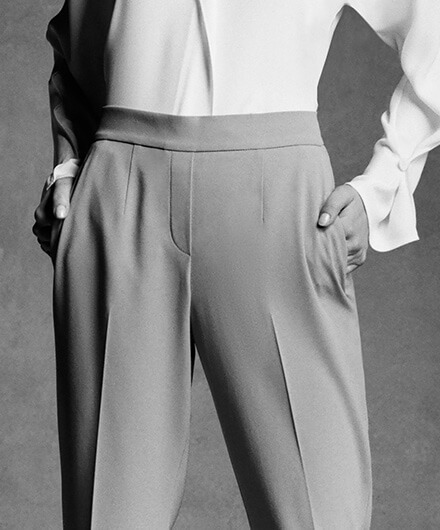 Our wide leg pants are fitted through the waist and hip, then flare out at varying degrees. There are lots of wide leg pants to choose from: cropped wide leg pants, check wide leg pants, black wide leg pants, culottes, palazzo pants, flares, cropped flares, high waisted dress pants and high waisted wide leg pants, to name a few. Plaid pants. Tartan pants. Check pants. Depending on where you are, plaid pants can be called lots of different names. Try skinny pants with a kimono jacket, a Western button-up or floral print (or all three). Cropped pants come in every silhouette. Wide leg cropped pants, slim fit cropped pants, skinny cropped jeans, cropped trousers, cropped check pants, cropped linen pants, cropped tights and more. Joggers for women aren’t just for sweating in. Camo joggers, linen joggers, black joggers, silk joggers and printed joggers are just a few of the options we have. Leggings are the slimmest of slim fit pants. One of the pants we’re best known for is leather leggings.